New Delhi, Jan 11, 2019 : Adultery and homosexuality have been decriminalised in the country by the Supreme Court, but the Army is “conservative” and they will not be allowed to “perpetuate into the Army,” Army chief General Bipin Rawat said on Thursday, The Hindu reported. Last year, the court decriminalised adultery as well as homosexuality. It asked the LGBTQ (Lesbian, Gay, Bisexual, Transgender and Queer) community to forgive history for their brutal suppression. However, there has been no clarity on how it would affect the Army, which punishes adultery for “stealing the affection of brother officer’s wife” and has a strict ‘no’ policy on homosexuality. 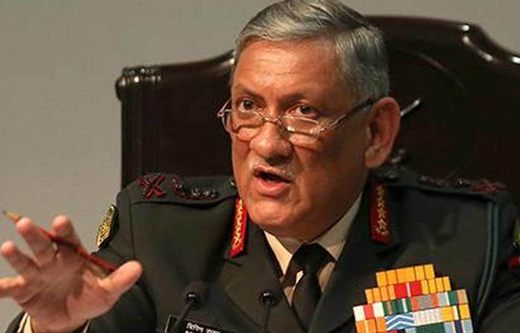 Stating that the Army is “certainly are not above the country’s law,” Gen. Rawat said that when one joined the Army, some of the rights and privileges authorised for civilians by the Constitution were not authorised for them [the Army]. “The Supreme Court has said something and we have to see how we take a call. Let us also see how this comes into the society,” he stated. Another issue is the disparity in the disability allowance between jawans and officers, or based on kinds of disabilities which he said has to be addressed. For this, the Army is looking at formulating a new disability policy, which Gen. Rawat said should be ready by mid-next year, after which it would be sent to the Defence Ministry for approval.